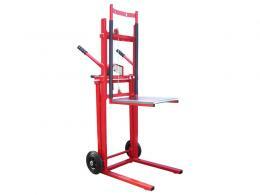 The Workplace Depot have a variety of stacking trucks from manual to battery to electric in all different capacity and lift heights. 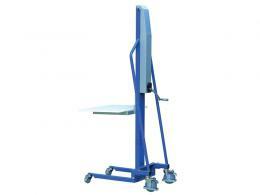 All types of stacking trucks allow staff to work without having to perform extreme body movements. 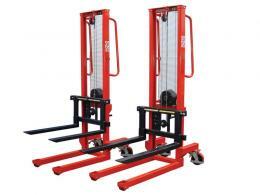 The battery and electric pallet stackers have excellent manoeuvrability combined with fast lifting and lowering, providing a cost- effective solution for frequent handling. The compact and counterbalanced manual pallet stackers are capable of handling single and double sided pallets, ideal for environments where space is at a premium. 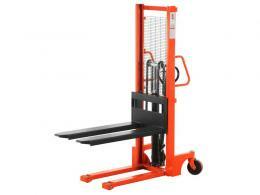 All pallet stackers are suitable for many applications such as, off loading lorries and vans, warehouse or production use. What is the purpose of a stacking truck? A stacking truck is a piece of utility equipment that allows several cartons to be stacked atop each other when moving them about within a warehouse or over short distances. It is recommended that this product be used for such purposes in order to increase productivity and efficiency. The robust frame supports up to 350kgs at a time, and is easily manoeuvrable on its roller-bearing supported rubber tyre wheels. Where can a stacking truck be used? Wherever heavy cartons are being shifted, the stacking truck will come in handy. 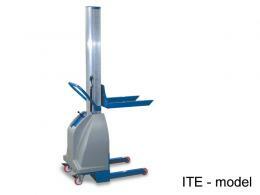 It is useful in warehouses that handle large numbers of crates and cartons; it can be used in hotels at vendor delivery points; it can be used by printers for carting out cases of books; in fact, the stacking truck is versatile enough to be of use in any place which is wanting in porting efficiency for lack of heavy-duty equipment for moving heavy crates and cases from point A to point B. Who might use a stacking truck? Warehouse supervisors will find this a highly productive piece of equipment, as will stock in-charges and inventory personnel. 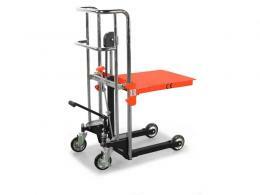 Packers and movers will find it handy when dealing with single-level jobs or where a service lift has been installed. Anyone who needs to stack cases and move them around will sorely miss the absence of this truly ingenious contraption. The roller bearings ensure smooth movement, while rubber or pneumatic tyres provide adequate impact cushioning. The tubular steel welded frame provides superior support for heavy trips, and the surface is impact and scratch resistant. The stacking truck is available in two models – the G102 with cushion rubber tyres and the G102L with pneumatic tyres for additional impact absorption. The all-welded tubular steel frame itself is resistant to impact, as well as scratches. The overall dimensions are 1600mm (H) X 570mm (W), and the fixed footplate (lifting blade) measures 300mm (W) X 250mm (D). The Workplace Depot offers a standard one-year warranty on all parts and labour. Our stacking trucks fully comply with all local council and government regulative manufacturing requirements to ensure the safety of your customers and staff.